Novel Care has been installing Bosch tankless water heaters in Toronto and the GTA for over 30 years. Bosch tankless water heaters off homeowners in Toronto an energy-efficient, endless supply of hot water. Bosch has an incredibly diverse lineup of tankless water heaters that are a great fit for any situation. They also come with the longest warranty in the business. Bosch is a brand name you know and trust for a reason. Bosch has been manufacturing a full line of home appliances for decades, including Bosch tankless water heaters. Also, known as on-demand water heaters, they’re a great solution for people who need to install a new water heater or replace an old hot water tank. Bosch tankless water heaters can save homeowners up to 50% on their gas bills. The reason is that tankless water heaters don’t work to constantly heat a massive tank of hot water, so it’s ready for use. While they work well to ensure a big supply of hot water, hot water tanks are incredibly inefficient. By comparison, Bosch tankless water heaters only heat water when you need it. 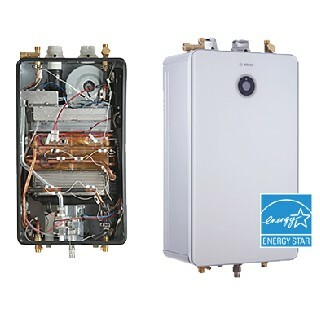 Whenever you turn on a hot water tap your tankless water heater kicks in and heats water, on demand. Now that’s efficiency. When you turn off the tap your tankless water heater also turns off until you need it again. Combine the great Bosch products with expert installation and maintenance from Novel Care and you’ve got a winning combination. Our tankless water heater installers have the experience and knowledge necessary to properly and efficiently install and Bosch tankless water heater. We always follow the manufacturers’ instructions and use our intuition to ensure that everything is set up properly, ready to go when you need it and configured to operate as efficiently as possible.